School Counselling in a Chinese Context discusses research in school counselling in the Chinese context of Hong Kong schools and various educational settings, and provides a contextualized understanding of counselling issues. 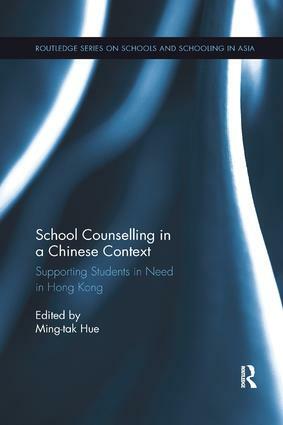 This book highlights key contextual conditions for counselling in Hong Kong – a Chinese society. The sub themes addressed in the book include school practices and teacher perspectives on guidance, counselling, behaviour support and school discipline; whole-school guidance program for identity construction; school counselling for ethnic minority students; contextual influence of the use of play therapy; school counselling for students with minority sexual orientation; Chinese cultural influence on counselling, etc. The book also develops new theoretical orientations to understanding various issues of counselling as arisen in the Chinese society of Hong Kong and helps school practitioners to develop culturally responsive approaches to school counselling for personal growth, spiritual and emotional education. School Counselling in a Chinese Context will be of interest to postgraduates and researchers in the field of Counselling, school psychology, child development and Chinese studies. Ming-tak Hue is a Professor, also the Head of Department of Special Education and Counselling, Director of Integrated Centre for Wellbeing, member on Faculty Board of Faculty of Education and Human Development, at the Education University of Hong Kong.